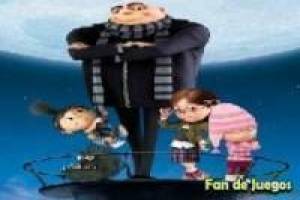 Despicable Me is one of the great successes in the animated world of recent years. It already has two movies, a spinoff of the Minions, and a multitude of games like the one we bring you next. It is based on Despicable Me 2, the second part of these movies and we can remember the best moments with these sliding puzzles. You will have to move the tiles from one side to the other until they adopt their correct position and we can see the original image. You have no time limit to get all the puzzles together but if you want to show that you are an expert you must do it very fast. Do not miss the best sliding puzzles of Despicable Me 2. Enjoy the game Despicable Me 2: Sliding Puzzle, it's free, it's one of our minions games we've selected.